Oh, summer, how bittersweet ’tis to lose thee! I’ve been spending a good amount of time observing the shifting in the seasons, lately. I take Mitra out every morning and take in the weight of the clothes I’m adding on, the chill of the frost on the grass when I’m in my dad’s backyard, or the whip of the wind off of the Hudson River when I’m home in New York. I stare at how the sun blasts up the luminosity of green leaves while dozing in my hammock, and the first touches of gold as I drive the Merritt Parkway back to the city again. The shadows on the brick outside my building seem a tad muted, now, and I know soon there will be only trunks sketched on them, their branches bare and trembling. But I love this time of year, the duality of it. At the local market the apples have taken their first sign of crispness and cold, while the peaches soften and bruise next to them. Last week I made a gingerbread cake with pears for a sunny social event, and I’ve already clipped my crop of herbs and stuck jars of gremolata in my freezer to get me through the winter. But then… there are still peaches. 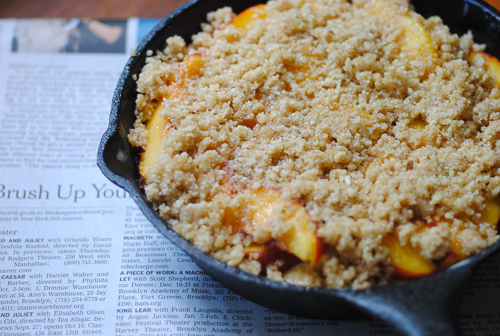 A few weeks ago I was smitten by some photos of a Buttermilk Peach Buckle by Toni at Boulder Locavore. Not only did I want to dive my face onto those plates of buckle, but I yearned for a cast iron skillet to start making winter-y sweets in. 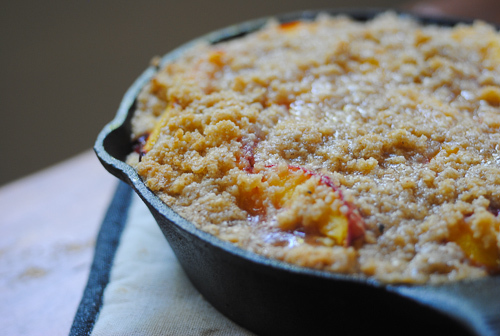 I have far too many heavy dutch ovens and baking pans, but not an old-school skillet. So, in a stroke of genius, I got 6.5-inch version. Because here’s the thing. I’m a (currently) single lady who lives with one roommate and can’t digest sugar well. I have nearly killed myself with having towering Milk Bar Monday cakes and 60-count batches of cookies in my apartment. I will eat an entire pie if left to my own devices. Which, while fun, does not make any part of me feel good. So I like making things in miniature, like Six Chocolate Chip Cookies or a Meyer Lemon Cake for Four. So, all you single ladies? Expect more small-batch versions up in here. 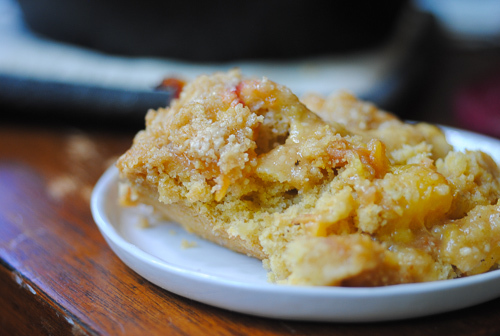 I wanted a somewhat sturdy base to sop up seeping juices and buttery crumble, and this one on it’s own makes a solid cornbread (gonna be fixing it up separately for that at some point) with a bit of added richness because of the almonds. 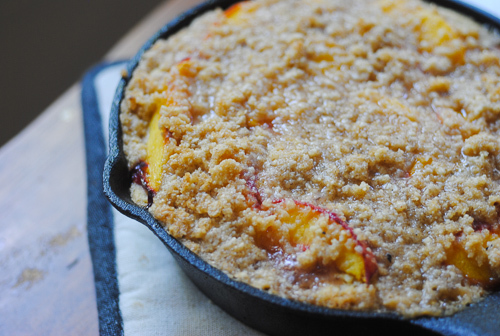 The copious amount of peaches in relation to the tiny pan mean that there’s a solid amount of fruit in every bite. So, yes, this is a healthy recipe. It’s practically good for you. I’ve tried using plain, unsalted butter and Earth Balance, but browning the butter a la Christina Tosi (more below) just sends this over the moon. It’s bubbly, it’s warm, it’s an oh-so friendly late-summer treat, portioned out for four. Meaning two couples on a date. Or four girlfriends with glasses of bubbly. Or you, your dad, his girlfriend, and you again. Or you and you and you and you. Or, today, me and the neighbors who are getting the rest before it’s me and me and me again. Yeah, so it baked next to a dish of acorn squash. It’s September, and I can bake what I want to. So this is a pretty easy-to-execute recipe if you’ve got yourself organized right. I made it after a barbecued lunch for a few friends a bit ago, and it was ready for adults to devour after the baby went down for a her nap (I love my little Lena!) I’m gonna give directions rather weirdly, so that you can get that down, with a full ingredient list to follow. I used both raw sugar and coconut sugar in testing this, and loved them both. If you’re going to stick with regular cane sugar, use white sugar for the fruit and cake and dark brown in the streusel. I used almond milk, but use whichever’s your go-to. And you can use regular butter or Earth Balance depending on your haves/needs, but browning it is just the best thing on earth. Preheat your oven to 350°. Butter a small cast iron pan or baking pan. Get out three medium bowls and one small one, plus a Pyrex liquid measuring cup. In one of the medium bowl: slice your peaches rather thickly, peeling some and keeping some fuzzy flesh on others. Squeeze some lemon over them (or, for those of you who need specifics, use a teaspoon), and then toss them with a few tablespoons of sugar (2 or so). Let sit while you get everything else together. Slice up 6 Tbsp of unsalted butter and put in the Pyrex measuring cup. The Christina Tosi method of browning butter I find the easiest not to mess up or make a mess of: find a small plate that fits the top of your measuring cup and place it on top in whichever way covers it the most completely. Microwave the butter for 4-7 minutes – this will vary depending on the size and thickness of the Pyrex you use. Zap until the butter starts popping, and then gets golden brown, with the solids falling to the bottom. Let this cool while you continue. In another medium bowl: Weigh out and whisk together your brown rice flour, almond meal, fine cornmeal, starch, baking powder and salt. I put both weights and measurements, but weighing is really the best bet. From one test to the next, my measurements differed. But Jacqueline, what if I don’t want to use cornmeal?! Then don’t, my friend! Use millet or oat or whatever you like, just stick to the weight. You could also do the same with the almond, but out of all the flours I tried out in these (coconut, oat, millet, white rice) this combo was by far my favorite. While you have those flours out, measure into the small bowl 2 Tbsp almond meal, 2 Tbsp brown rice flour and 1 Tbsp tapioca starch. Set aside. In the final medium bowl, beat your egg, gently, because it’s not nice to beat things too hard. Add the sugar and milk, and whisk together until slightly thick and frothy. Pour half of the melter browned butter onto the dry ingredient in the small bowl, and stream the rest into the egg/sugar/milk mixture while whisking quickly. Pour the large bowl of dry ingredients onto the wet, and use a spatula to combine into a thick batter. Pour this batter into the pan and press down to make it even and flat. Arrange the sweet peaches on top, covering completely in weird angles and layers. You may have a few slices leftover. Just eat them – they’re yummy. Resist pouring the juice on top – I did in this final photographed version, and it made the center a little puddly. Still yummy, but not as pretty. Toss 1/4 cup more sugar onto the small bowl of dry ingredients and butter, and mix it all together into a crumbly paste. Sprinkle this evenly over the peaches. Bake for 26-30 minutes, until bubbly and browned. Cool for 10 minutes or so before slicing into four and serving. This is best fresh from the oven, but will keep in the refrigerator and reheated the next day just fine, too.